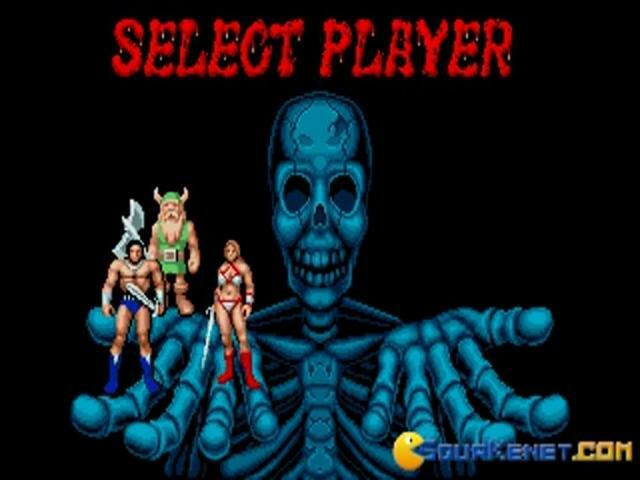 Anyone who has enjoyed scrolling fighters like Streets of Rage, Altered Beast or Final Fight is sure to enjoy this classic slice of arcade action, and it remains perhaps the best of the crowd. While the gameplay might be simple enough, it is never less than enjoyable and when played with a second player, it makes for a supremely entertaining game. 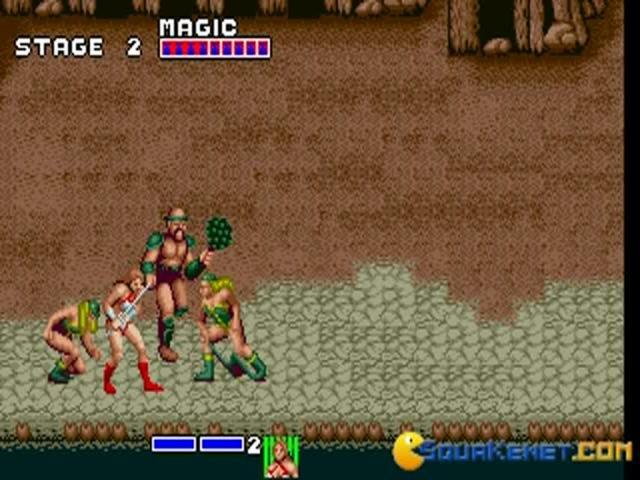 The story is simple enough, taking a typical fantasy tale of an evil warlord, the excellently named Death Adder, who has kidnapped the kind and his daughter along with the legendary Golden Axe, and threatens to destroy them if he is not granted ultimate power. 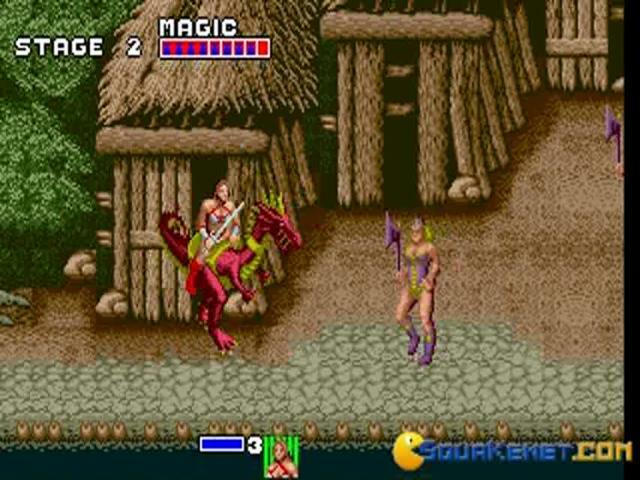 What this means for the game is that the player gets to choose one of three bold heroes, each with their own unique moves and abilities, and who must then proceed through a series of side scrolling levels, bashing the living daylights out of Death Adders minions. 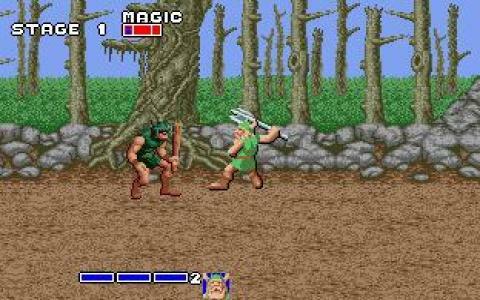 Alongside standard brutal melee assaults, magic plays a big part in the game, with each character having access to a powerful spell which can sway the course of battle. 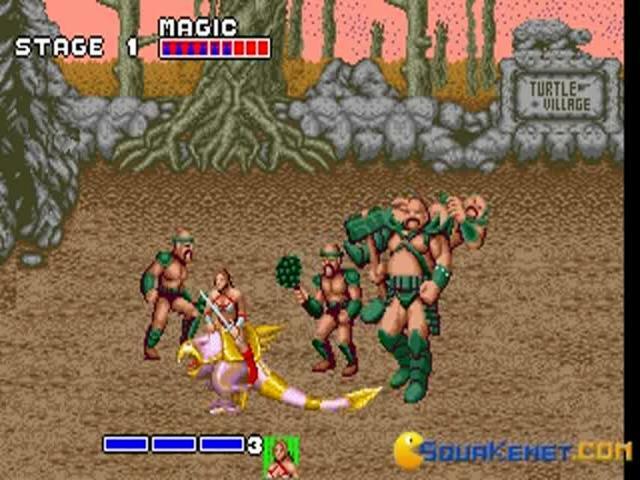 However, the feature for which Golden Axe is perhaps most fondly remembered is its steeds, which allow players to ride around on the back of monstrous creatures, thwacking enemies with their tails or blasting them with fireballs, and this is undoubtedly a highlight of the game. 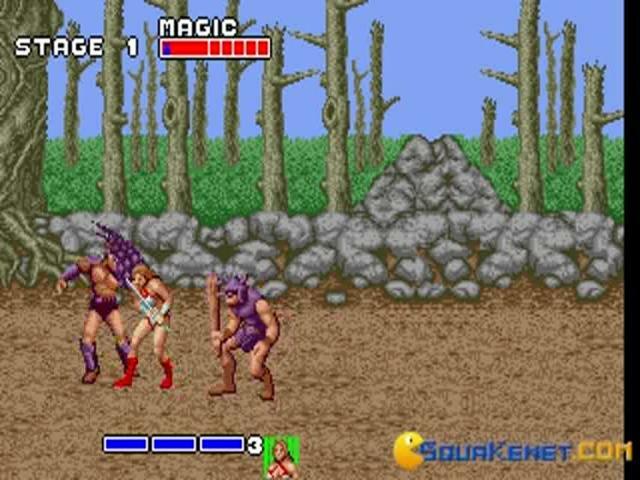 The other strong point is the two-player mode which is clearly the best way to play Golden Axe, and in this fashion especially, the game is an absolute hoot. 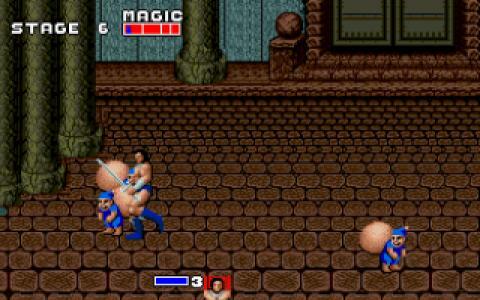 The moves might not be extensive and the combat is not overly complex, but it is fun, while the graphics and sound are equally good, with plenty of well designed environments and slick effects. 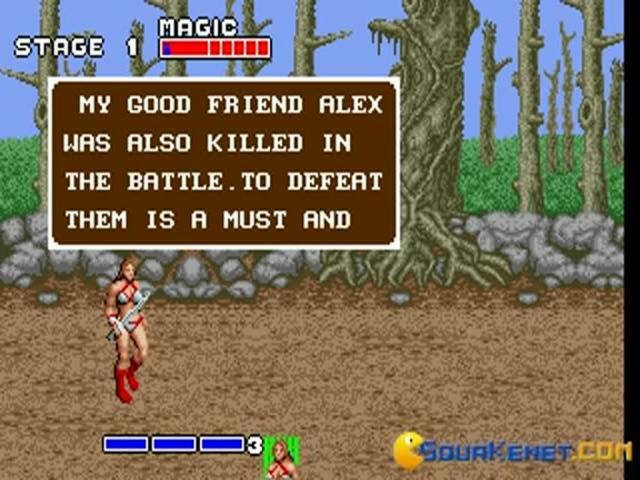 For straightforward arcade action, this is tough to beat. 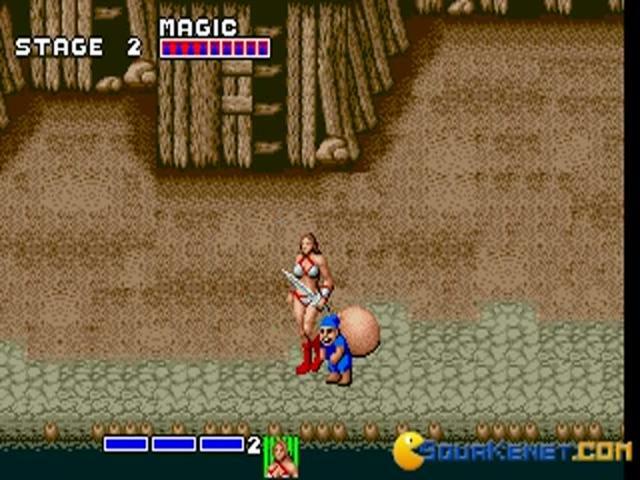 Check out the sequel, Golden Axe 2, for more of the same. 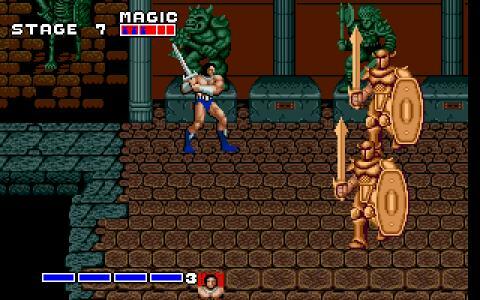 The 16 bit barbarian that we all wanted to be like! 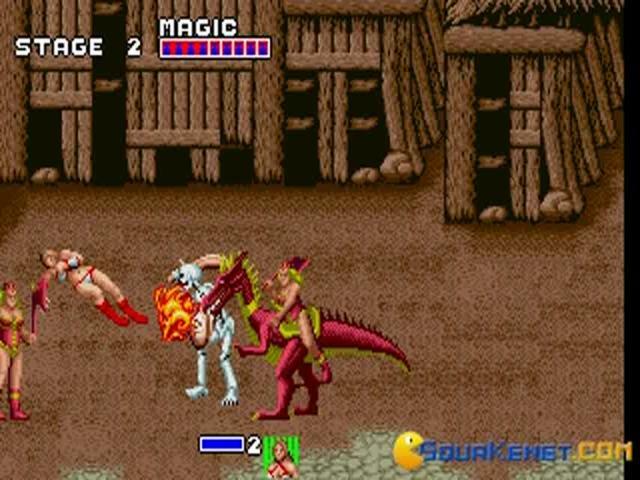 Rahan, the superhero of the wild beasts, clad in leopard skins has scarred a lot of enemies and a lot of children who were exposed to its barbarism ahead of their time. 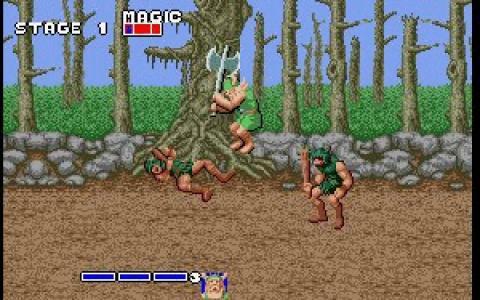 But, nonetheless, the character was much loved, and thus, a similar themed game, with barbarians oozing masculinity was conceived by Sega, and released in the form of a sidescroller, beat them up, fight them up and go ape wizard style on them depending on what option you find better. 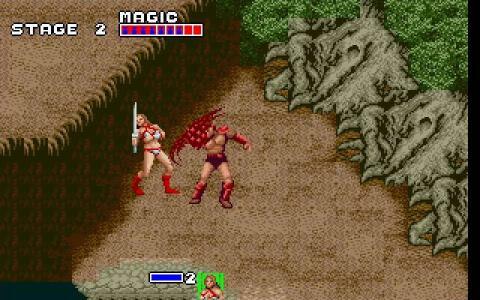 Therefore, Golden Axe is fondly remember as a bit of a hybrid, best described as a cabinet era sidescroller with bits of RPG here and there, for good measure. 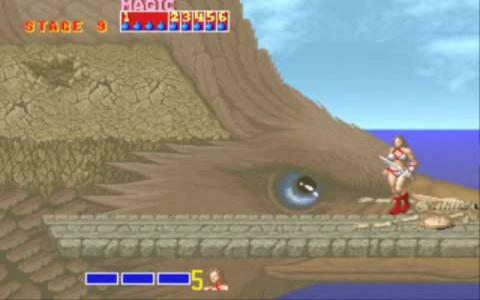 Graphically, it was undeniably Sega, very colorful, not the most graphically detailed, but having that feel that it was a game took by force out of a comic book! 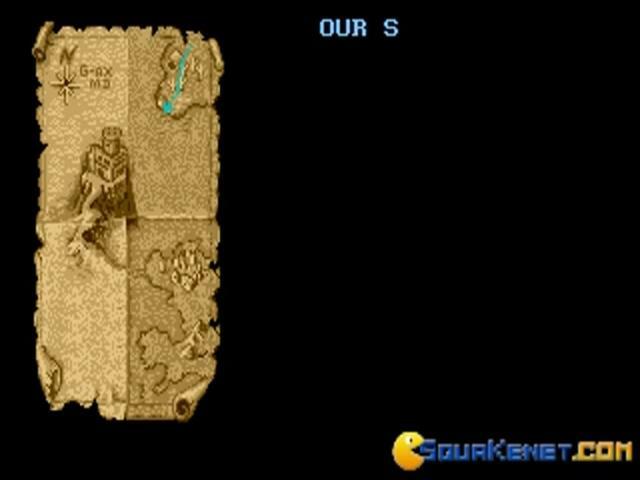 I, for once loved it, and I can attest that it is a mighty playable game, with diverse gameplay, depending on whom you choose you play with, not as hard as you would think, and also not as dumb as some others would think! 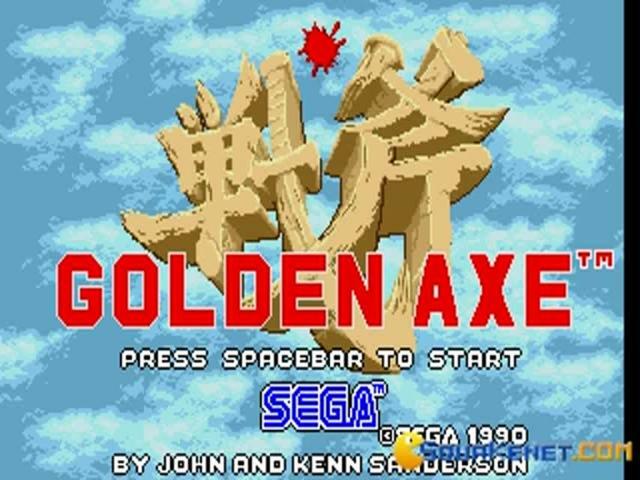 Really worth a go, if you love things like Hammerin Harry or other very arcadey let to righters.